The Point or the Punch is used after any initial work with the tracer or the pitching tool. The Point and the Punch are used to rough-out the form. The Point differs from the Punch in that the latter tapers to a small cutting edge where the former tapers to a single point. The Point is known and used by all stonecarvers for roughing-out, while in the United Kingdom the Punch is also commonly used for this purpose. The Punch is neither well known in the United States, nor ordinarily available from domestic suppliers. examples of the Point are sometimes found. The tapered point or cutting edge of these chisels transfers all the force of the hammer blow to remove material off the surface of the block. The Point is the most efficient chisel to remove large amounts of waste during the carving of marble and similar stones, though for softer or less dense stones the Punch is equally effective. 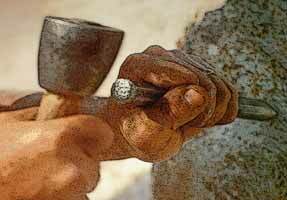 The manner in which the chisel is gripped varies according to regional traditions, personal preferences, or to the type of work being done. In the picture above the two hand positions on the left are the most commonly observed hand grips, especially during the roughing-out stages of carving when relatively powerful blows are struck. The second of these two positions has the advantage of moving the thumb out of the way of the inevitable missed hammer-blow. Work gloves are usually worn in the early stages of the carving. The two hand grips on the right seem to be favored primarily when doing carving of details or during lettering work, allowing a greater sensitivity to the control of the tool. For the same reason many carvers set their gloves aside and work bare-handed when doing finishing work.